Here are all our animal outline tracing pages for younger children. Trace and colour for pencil practice. For the classroom, why not laminate a set and provide dry wipe markers so that you can enjoy the pages over and over again? Children can trace over the dotted lines to create their own picture of an antelope – perfect for an African animals topic. Trace around the outside of our badger tracing page and then have fun colouring it in. Practice your pencil skills with this simple bat tracing page – perfect for the youngest children. Use a thick pen or crayon to trace between the dotted lines, or a pencil to trace on them. I can't imagine many more appealing ways for a young child to practise their pencil control skills than tracing the dotty lines on our lovely bear tracing page. The dotty lines to follow on our bison tracing page are a good way to give children pencil control practice. Our buffalo tracing page features a rather kooky looking buffalo, but we think that the kids will enjoy it! There's lots of tracing practice, too. Get young children drawing by printing our cute cheetah tracing page for them to complete, all they have to do is draw over the dotted lines. Have young children practise their pencil control by following the dotted lines on our deer tracing page to draw their own magnificent stag. Children can trace the outlines of this lovely dolphin, then colour him in. Great for practising pencil control! This lovely elephant tracing page is designed for little children who are practising their pencil control. Beginners can use a felt-tip pen or crayon to trace between the lines. Those with a little more control can try tracing over all the lines. Younger children can trace the lines on this fox tracing and colouring page. It's a fun way to practise pencil control. This fox tracing page is such a lovely one for autumn or wildlife topics, showing the fox curled up and peacefully asleep. Children can trace in between or directly on the dotted lines. I love this giraffe face! It's a good tracing page for younger children, with its simple lines and fun expression. Here is a tracing page featuring a funny gorilla face which we think the kids will enjoy. Trace within the lines, or trace over them. The gorilla looks a little fierce! A fun addition to a minibeast project for young children. Trace the dotted lines to complete our grasshopper tracing page. Here's an interesting tracing page for the kids, featuring a funny hedgehog looking straight at them! Trace between or on the dotted lines for some excellent pencil control practice. Our hedgehog tracing page is one of our trickiest. Can your children follow the zig zag, dotted line to draw the hedgehog's spikes? Here is a fun way for kids to work on their pencil control – trace over the dotted lines on our hedgehog tracing page! Younger children might use a thick crayon or felt tip pen to make marks with in the dotted lines. The cuteness factor of this hippo will have even the most reluctant writer reaching for their pencil to trace the dotted lines on our hippo tracing page. Trace the lines to create this lovely hippo face – I think the kids will enjoy it! Younger children can trace between the lines; older children should trace on them. How gorgeous is our jellyfish tracing page? It is sure to make even the most reluctant writer pick up their pencil and start tracing those dotty lines. Here's a lovely ladybird tracing page to print it is sure encourage young children to pick up a pencil and follow the lines. There are plenty of dotted lines to draw over this fun leopard tracing page for younger kids. Of course they can colour in the picture Rinne tracing is done, too. Even the most reluctant drawer won't be able to resist picking up a pencil to complete our magnificent lion tracing page. This lovely lion tracing page will give the kids plenty of pencil control practice, especially if they trace over all the dotted lines. Younger children can trace in the channel between the lines. We have lots of lions at Activity Village, but not many lionesses! Here is a lioness's face with dotted lines for the children to trace. Children will love practising their pencil control skills with our cute lobster tracing page. How cute is this mole? The kids will feel be sure to feel proud when they draw their own mole by tracing the dotted lines on our mole tracing page. Practice pencil skills with this adorable little monkey tracing page! There are two dotted lines: older children can trace each one separately while younger children might like to trace between them. Here's a fun monkey face picture for the kids to trace and colour in. Trace within the dotted lines (younger kids) or directly on them. Our magnificent moose tracing page with antlers to trace is a fun way for children to practice their pencil control skills. Children have to trace over the dotted lines around the body and four tenticles to complete the octopus on this tracing page. Younger children will enjoy tracing the lines on this cute pig tracing and colouring page. It's a fun way to practise pencil control, and perfect for farmyard themes or for Chinese Year of the Pig celebrations perhaps? 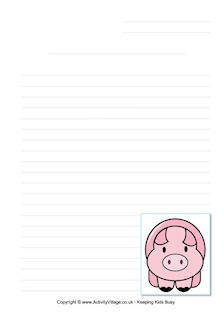 This simple pig tracing page is a fun activity for younger kids and helps them to practise pencil control too. The Platypus is a semiaquatic mammal from Australia. He looks quite cute but can give you a sting with its back legs! You can trace his outline to practise pencil control, and then colour him in. Younger children should be encouraged to trace between the dotted lines of this rabbit and carrot before colouring in. Older kids could trace on both sets of dotted lines for a more challenging activity. Here are two lovely reindeers for the kids to trace - and they will be getting lots of practice that will help to improve their handwriting while doing it! Once traced they could colour the reindeer in, or add some extra decorative touches. Our sea lion tracing page has dotted lines for children to trace to complete the picture. Tracing lines is an excellent way of building up pre-writing skills and our sea turtle tracing page will make it fun. After children trace the lines on this seahorse tracing page they can have even more fun pencil control practice by colouring it in. This picture of a shark needs finishing off. Trace around the outline for some pencil control practice. Practise pencil control skills by tracing the dotty outline of our slippery snail and then colour it in. Trace the front legs and body to finish off our spider tracing page, fun for Halloween or a minibeast project. Trace the dotted lines of this cheeky squirrel. It's good practice for pincer control and pre-writing skills and perfect for the autumn classroom. With lines and circles to trace our starfish tracing page is a fun challenge. We've drawn some of this picture for you but children will have to carefully follow the dotted lines to complete our wildebeest tracing page. Our cute zebra colouring page needs someone to trace the dotted lines to complete the picture, a fun way to help with motor skills development. Kids can trace over the dotted lines on this fun zebra face. Fun and good practice too!